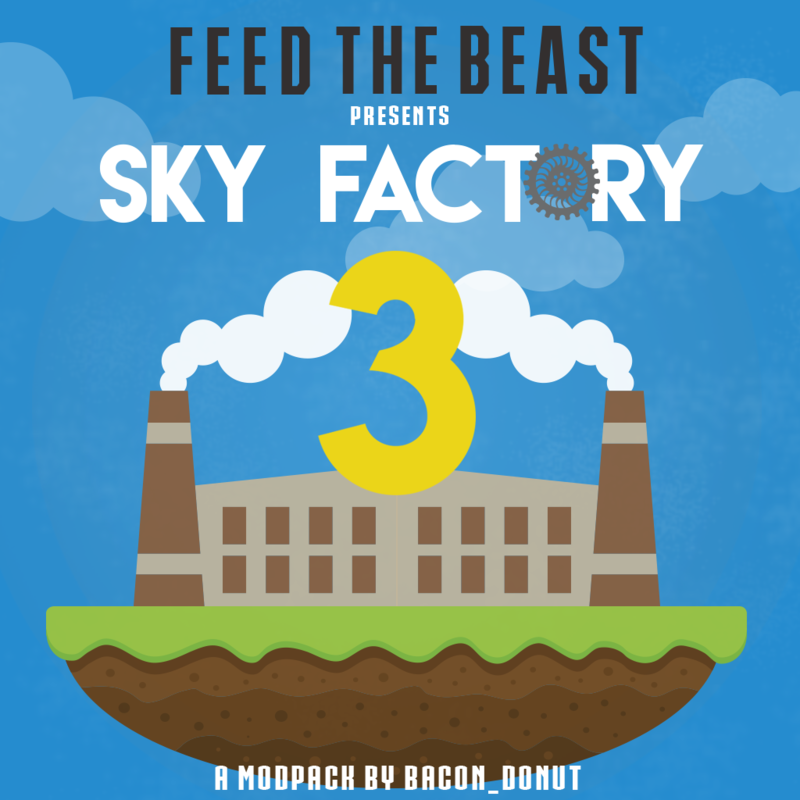 This should mark the final update for SkyFactory 3. This last update comes with a number of mod updates which should fix many of their individual bugs not pack specific. Keep in mind, not every bug from every mod is fixed. Thank you for the positive feedback and happy crafting! Mod now uses Forge Energy instead of RF. Note: The original version will continue to be maintained for 1.10, ContentTweaker will be required for using Zenscript with V2, see here for an example script. Documentation will be added in the coming days. Levers can now be placed on Storage Blocks. Added Porcelain Faucets: basically seared faucets but visually different and crafted from porcelain bricks. Made raw clay armor not enchantable. Switched "block check" to "fluid handler check". Barrels now show the faucet flow at the proper depth for extended barrels. Clay buckets can now be filled in casting tables. Fixed an issue with light blue porcelain clay name. Fixed barrel extensions not syncing master location to the client properly. Fixed a crash caused by a missing "@" sign in dependencies string. Began writing web hooks to use less web calls. Applied some cosmetic code changes. Mod now uses singular Random class for all rewards. Updated Extra Utilities 2 Mod hook. Added the ability for users to not check for globally disabled rewards and added a disclaimer. Updated how Scheduler and tasks worked. Method organization for possible future forge changes (*cough* blockStateFromMeta *cough*). Lots of other smaller tweaks and changes. This allows chests to be upgraded/downgraded by right-clicking them. The tool will look for the corresponding chests's blocks for respectively the next and previous tiers and replace those with the blocks in the chest. Added a "Obsidian Colossal Chest" variant. Mod will now load after IC2 to fix an init crash. Added tooltips to infobook navigation buttons. Added abstract MineTweaker support for handling recipe registry. Mod now allows recipes to be unregistered. Mod now allows min and max values to be set in number fields. Added an option to make XML recipes NBT-sensitive. Fixed: Always load world from DimensionManager on server-side in DimPos. This catches the cases where the world has been unloaded, and as a consequence become Nullable. Allowed config support for blocks with metadata, You can now add ExtraUtils2 and ThermalExpansion machines! There's a bug report of a crash that occurs when you exit the table. If this happens to you, please submit it along with what happened when you crashed (and a crashlog too). Mod author was able to reproduce it one, but not again after that and would like to get more data on what is causing this. Added a config option to automatically set mipmap levels to 0 and off-thread chunk rendering to on with fresh instances. The grue timer can now be reduced down to a single second, and increased up to a minute. Brightness calculations have been tweaked to take skylight into consideration (no more grues spawning under a tree). Added RF to Fertilizer Mixer, for allowing it to mix faster. Fertilizer Mixer can accept fluid pipes from any side now, and will push or pull the correct fluid (water/liquid fertilzier). Added a GUI to Hatchery Nesting pens. Switched nesting pens to use new inventory storage code. Fixed the recipe for generators so it uses redstone blocks instead of redstone ore. Fixed a major bug with Nesting pens. Fixed interaction with all new blocks and GUI. Updated the Generator model, and added animation to generators that are on. Fixed Chickens not having AI when removed from pens. Fixed Animal nets not removing the chicken's name when placing in a nesting pen. The One Probe integration should be re-enabled. Currently supports nesting pens and egg nest. Start of a new Block: the Feather Shredder will allow players to shred feathers into feather fibers and feather meal. Will be used for new items. Added "On the Dynamics of Integration", an in-game guide to the mod, which also contains achievement-based tutorials. Added MineTweaker support for the Drying Basin and the Squeezer. Mod now supports dynamic item list creation in the Logic Programmer. Added Crystalized Menril Block/Brick and Menril Plank Stairs. Added Delayer block. It allows you to maintain a relative history of values. Added a config option to change the max network energy transfer rate. Mod now allows JEI recipe transfers to Logic Programmer elements with slots. Made Energy Battery capacity increasable by combining them in a crafting grid. Improved block and item value type rendering in-world. Moved value types before operators in logic programmer. Mod now allows null items, blocks and fluids to be defined. Exposed generator slots for piping. Added a check to disallow positioned network elements to interact with themselves. Properly scaled values in variable-activatable tile GUI's. Made proxies and delays stackable and clearable. Clarified infobook instruction on operator creation. Made part loaded checks safer, fixes an issue with Integrated Tunnels. Fixed part aspect settings not being restored on world load. Fixed LP element activation using hotkeys not working. Added config options to change max network energy and fluid transfer rates. Added a "Tunnels" sections to Integrated Dynamic's "On the Dynamics of Integration" with achievement-based tutorials. Exposed capabilities in interfaces. This allows external machines to actively interact with the interfaces, which are passive by-default. Fixed fluid exporters sometimes transferring the wrong fluid. Added better handling for critical bag config errors, now with more useful crashes! Added hay and glass wedges. Added support for Natura Mod. Corrected some log recipes for Natura and Polished stone recipes for Mineralogy. Added Singularity Tank with a Drain to store player XP while standing on it (this mechanic has a loss system). Player now obtains a bottle of enchanting when using an empty bottle on tanks - consumes 200mb of fluid xp. Fixed a crash when using GM Chicken feed on Hatchery Rooter Mobs. Fixed XP Orb ratio being all wrong in the calculations. Fixed interaction with modded wrenches on fan blocks. "Some other things - that I don't remember because Darkosto needs a release and I'm rushing." Fixed a possible Custom Main Menu integration crash. Added Base Metals crops: Aquarium, Cold-Iron, Star-Steel & Adamantine. Overworld and Nether bookshelves will now drop the correct book and not one with a missing texture. The recipes for sticks now give the correct amount! World Generation will no longer cause recursive world generation! Added support for CraftingTweaks's buttons that it adds to crafting tables. Bloodwood trees will no longer grow at y level 0 when planted on only one layer of Netherrack! Added metadata support to both blacklists. Added ore dictionary support to overrides. Defaulted undo history to 0 due to instability. Fixed a serious XP miscalculation. Fixed air blocks counting as potentially valid. Fixed undo still collecting history when disabled. Back ported the new model for QuantumStorage unit. Fixed a rotation bug with the new model. Pushed forge energy, closes a lot of issues on the TR tracker, and an issue with Fluxed Redstone. Fixed GUI builder backgrounds sometimes being coloured incorrectly. Fixed machines not being able to accept FE. Additions for newest mod builds. Fixed incorrect values used by my coloring code (most noticeable when changing Terraqueous flower pot color with dye). Fixed issue with cable not having FE capability. Upgrades are useless, for now. Added a TreeTap module and added support for IC2 trees. Backported some fixes from the 1.11.2 version. Added a Tree Tap Module. Fixed TerrainLighter not being able to place some blocks (i.e. Project Red: Lantern). Added support for Biome Dictionary (Penguins should now spawn in any modded biome with the appropriate Biome Dictionary tags). Tweaked penguin ambient sounds, to hopefully make them less annoying. Natura's override Nether option allowed the nether to generate normal terrain. This option has been reverted to false. This is probably the largest fix of this version and would have been released sooner but I put it on hold to wait for a number of mod updates. Edited the Changelog button on the main menu to not crash out the game any longer. Added shinoow to HeadCrumbs' list of modders heads. TwitchCrumbs will now also include subscribers to Bacon_Donut's twitch channel amongst its list.